Here’s our fantasy premier league teams GW33 article where we give our early thoughts on the FFGeek team for GW33. We look back at double gameweek 32 and give our thoughts on the gameweeks ahead. For free hitters the gameweek was decided by players on the fringe of the template in Azpilicueta, Jimenez and Laporte. I only had 1 but Ederson, Luiz and Tomkins got me a decent score. I was watching the Man City v Cardiff (was it a training game btw. It comes to something when a near reserve team can so comprehensively outplay another PL team fighting for their lives but that’s another story). Anyway as I was watching that game I was just waiting for confirmation that Brighton had scored. Thankfully it never came. I don’t think this season I’ve had 2 defenders from the same team before but it isn’t half a stressful process. Hazard, the Man City defence and the Chelsea defence turned up and Huddersfield again showed how as opposition they are a clean sheet magnet. 1 transfer and £0.9m in the bank. I will be wildcarding in GW34, bench boosting in GW35 and maybe triple captaining for the Liverpool home game to Huddersfield in GW36. I have a full quota for the blank GW33 and then some. The fact that I’m wildcarding means that I have a 1 game transfer where I only need to consider this week and nothing more. Therefore I won’t be doing a team planner schedule. Given it’s a one off transfer anyone playing Huddersfield is an obvious target. I already have Vardy and the likely candidates after that are Maddison or Barnes in attack. That’s unless I go for double defence. The issue with getting a midfielder in though is that I would have to get rid of Richarlison who I don’t really want to. After an horrendous spell of form he’s finally come right with 2 goals in his last 3 backed up by excellent underlying stats. Having survived the double Chelsea defence experiment I could go double Leicester vs Huddersfield and put in Pereira instead of Ben Mee. The other option is to put in Callum Wilson vs Burnley for Rashford. 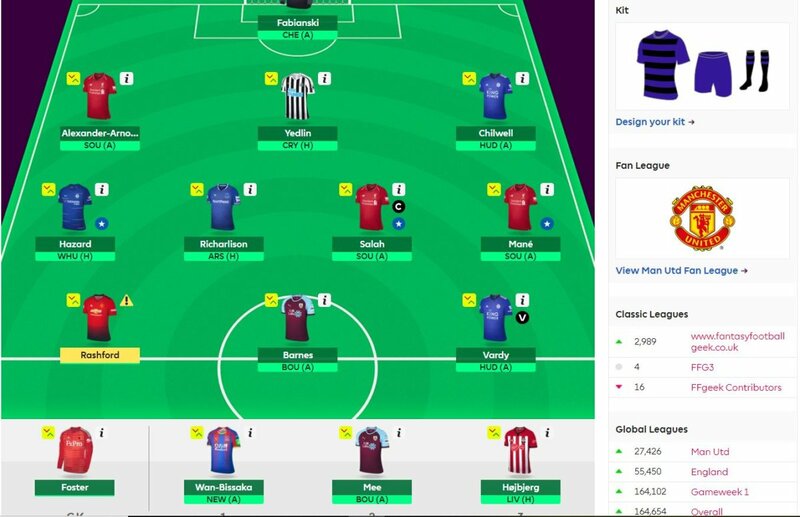 Both those transfers would mean I don’t need to field Wan Bissaka at Newcastle who I’m not sure is a great clean sheet prospect. My most likely option is Wilson in for Rashford but I’ll confirm tomorrow. A tricky one this week that’s for sure. At the moment I can’t split myself between Salah, Mane, Hazard and Vardy. How helpful a start is that? I don’t fancy doing a 4 way article tomorrow. The FFGeek Polls will play a part if there’s any pattern if not it will be totally on the analysis. Unfortunately it seems no matter how much you do there’s no clear answer. At the moment it’s on Salah despite his pretty indifferent form, to say the least, but it is only a placeholder. The one advantage of a blank week is that your lineup isn’t an issue and that is the case this week. Remember it’s a Friday UK time gameweek. The clocks went forward an hour in the UK last week so make sure you don’t get caught out. Although I imagine everyone has a smart phone which automatically adjusts do double check. Also, set your team up provisionally now, as depending on where you live, if you get dragged to the pub tomorrow and forget or over sleep through your alarm, you have some semblance of a team. Hope you had a good gameweek. Fabianski seems a transfer that you are in more of need of making and just start AWB? Thanks for the alert on the Friday start! I have Aguero (bought at 11.2), barnes and Wilson. Would you sell Aguero and Antonio for Timelmans and Vardy and lose money on Aguero or just do Barnes and Antonio for Vardy and a <= 5.7 mid. Have 9 players at the moment and loads in the bank and am wildcarding gw34. Stick with 9 players or take -8 hit and get a full 11 playing? Only Liverpool player I have is Robertson so buy mane/Salah? 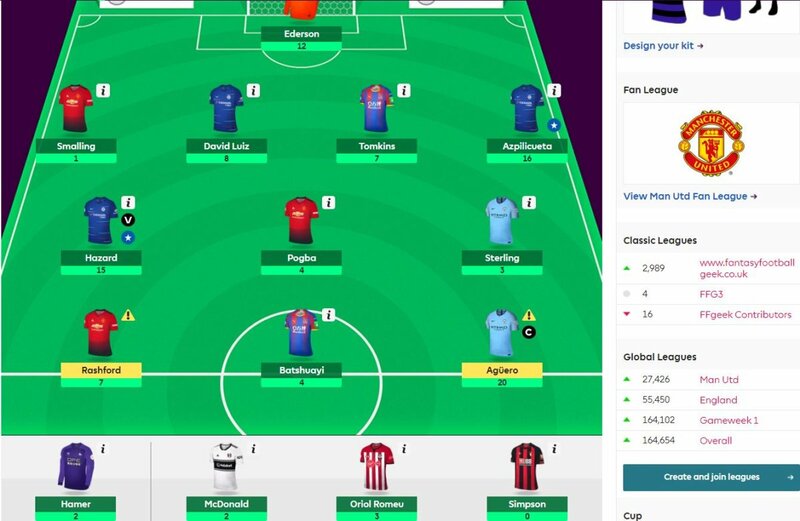 Ross – I would normally say accept your medicine, run with nine and then enjoy the great fun snd big points from your GW34 wildcard. 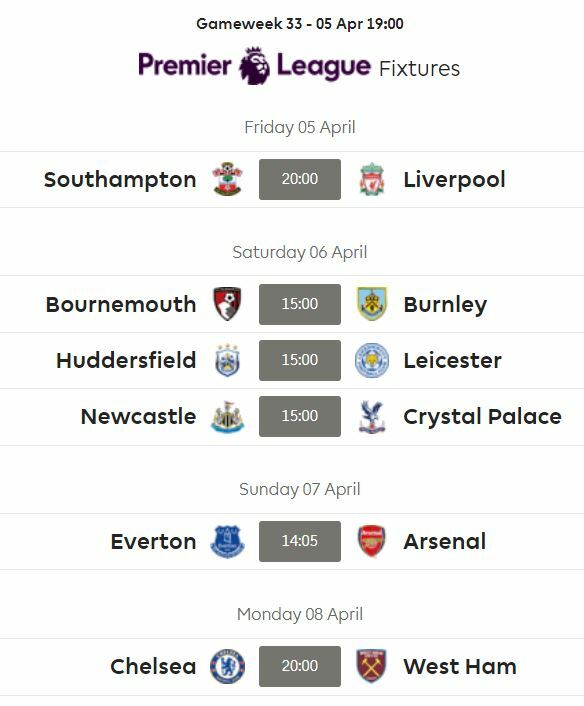 However, a one week only punt on Mane and Salah sounds appealing. In effect, as you have no subs that would normally step in, the hits ate effectively only 2 points each as you will get 4 points back just from Salah and Mane playing. Therefore, the worst case is you lose four points, assuming they play, and think of the extra enjoyment watching the game with them in, instead of hiding behind the sofa dreading them scoring. This game is about enjoying it, so for me, take what is really a 4 point risk, sit back and enjoy the game, and hopefully you will be celebrating some nice extra points when it comes off !! Absolutely take the hit… Liverpool will score for sure against the Saints and as Andrew pointed out, it is only effectively a -4 hit for 2 players. It’s a no-brainer. Geek… I think Tielemans is a better shout that Maddison right now. He is in excellent form. I have brought him in for triple Leicester (Vardy and Perreira). I had the funds to upgrade Billing so now I can bench AWB. GW34 wildcard and GW35 Bench Boost should be fun… Watford assets look very appealing, especially should they exit the FA Cup the weekend as concentrating on 7th will be their only target. Higuain goes out. Which player will you guys suggest for? Lacazette is my first option or Wilson, I guess. If I get in wilson, I’ll have enough to upgrade Hayden to Madisson or tielmens. Should i take the 4 point hit and go higuain and Hayden out for Wilson and Madisson/tielmens? It’s effectively just for a gameweek as wildcarding the next one. Also concerned about Luiz(whether he will start), but I guess higuain is less likelier. All my subs are non starters this week.